KUALA LUMPUR: The weaker business confidence expectations for the first half (1H) of 2019, as indicated by recent surveys, is expected to continue for at least another quarter or two before sentiment improves, say economists. The economists contacted by The Edge Financial Daily said the less optimistic outlook displayed by Malaysian businesses is due to both domestic issues as well as the global economic slowdown, along with the underlying uncertainty surrounding the Sino-US trade dispute. “Confidence is an issue. There is a lack of confidence because of these external and internal issues,” said Socio-Economic Research Centre (SERC) executive director Lee Heng Guie. On the US-China dispute, Lee said even if there is a truce or a deal, businesses will be more wary going forward, given that the trade protectionist mindset will still be there. 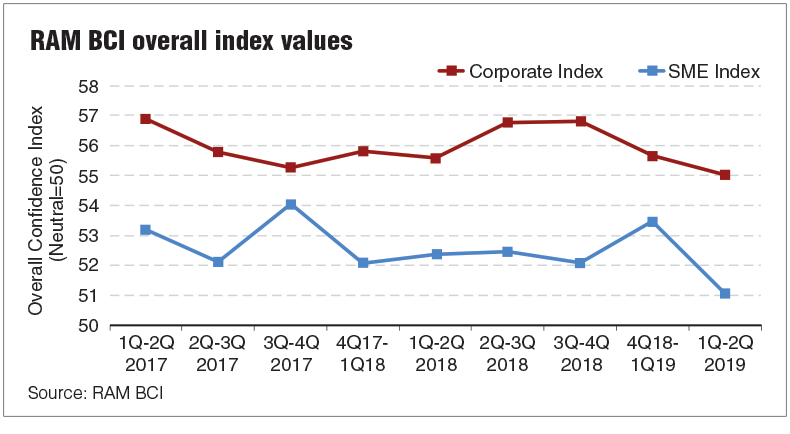 The RAM Business Confidence Index (RAM BCI), based on a survey conducted by RAM Holdings Bhd and RAM Credit Information Sdn Bhd, showed that business confidence for the first six months of 2019 has fallen to the lowest level since the index began tracking in 2017. Some 3,500 firms, both corporates and small and medium enterprises, took part in the survey. The Statistics Department has also stated that business confidence in the first quarter of 2019 has softened with the confidence indicator dropping to -2.2% after rising 7.1% in the fourth quarter of 2018. Lee said the change in government also contributed to the fall in business confidence, with businesses holding the view that policies are still unclear in terms of direction. While these uncertainties in both the internal and external environment remain unsettling, Lee cautioned against the prolonged effects on the businesses’ confidence. He said businesses turn more cautious when they feel that the demand is slowing, and when this “cautious feeling” is dragged longer, the firms will adopt a wait-and-see approach, whereby they will spend only when others do. Noting that private investment growth in the fourth quarter of 2018 was not very encouraging, Lee said it reflects the cautious stance among investors in Malaysia. Peck Boon Soon, head of research at RHB Research Institute, who sees the dampening business confidence as a natural reaction, said business activities and confidence levels are only likely to improve gradually at the end of the year. “I believe that we've seen that the US Federal Reserve is turning more dovish and the European Central Bank is indicating that they may delay the interest rate hikes towards 2020. And China, on the other hand, is easing the policies to stimulate the economic growth,” said Peck. Central banks in some other countries too have taken measures to support economic growth, noted Peck, adding that it will take up to 12 months for the impact to be seen. On the domestic front, Peck noted that only consumer-related businesses are holding up growth and will “feel slightly better”, whereas other businesses, including those involved in construction and housing development would continue to feel uneasy. Nonetheless, Peck believes that the government infrastructure spending is likely to pick up momentum in the second half of 2019, especially with the mega infrastructure projects such as the mass rapid transit Line 2 and light rail transit Line 3 in place, which will then slowly increase consumer confidence. EAC the silver bullet to lift confidence? While business confidence has been on a downtrend since the 14th general election in May 2018, some economists are hopeful of a turnaround following the recent setting up of the Economic Action Council (EAC). “There is a high urgency now for the newly-formed EAC to come up with short-term measures to get more engagement with the businesses to understand as they are the ‘pulse’ of the local economy,” said SERC’s Lee. “I’m hopeful to see more actionable, workable, and implementable short-term policies from the EAC or the government, which would help to bump up the business confidence,” he said. Lee pointed out that while the government is unable to control external variables, it could still manage the internal business conditions. Putrajaya, he said, should start looking into ways to attract more investors or businesses into the country, enabling Malaysia to become their first priority in the region. “The government has to look at a longer term. Malaysia has to be very aggressively engaged in bilateral or multilateral free trade agreements,” said Lee, adding that the country has to be prepared for other unexpected trade disputes, apart from the current US-China trade war. Peck concurred, saying the EAC should introduce measures to boost economic activities that would allow confidence to slowly return. “I think they have done a fair bit of things — returning some of the unreturned GST (goods and services tax) and income tax. Recently they tried to cap the fuel prices, which would involve some subsidies from the government. That would help to some extent maintain the confidence level of the consumers,” he added. Given the external headwinds, UOB Malaysia senior economist Julia Goh said local companies are looking to the government for policy support. “The government is straddling to manage the country’s public finances, execute reforms, deliver Pakatan Harapan’s manifestos, and grow the economy,” said Goh. There are high hopes that the payment of RM37 billion of GST and income tax refunds will lift the economy, she said, noting however that this will still depend on whether businesses feel confident enough to spend. In addition, she highlighted the need to identify new sources of growth as the country leverages on intraregional trade and investments. She also noted that further improvements in regulation and liberalisation to enhance competitiveness will improve the business confidence level, adding that the pace of reforms and execution needs to be stepped up.